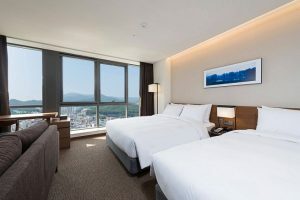 Hospitality powerhouse Wyndham Hotel Group introduced its first Ramada Encore hotel to Busan with the opening of Ramada Encore Busan Haeundae. While bolstering its portfolio of midscale offerings in South East Asia, Wyndham Hotel Group is offering business and leisure travellers sophisticated and convenient accommodation in the heart of South Korea’s second largest city. 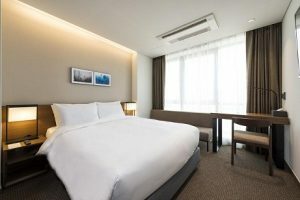 The newly built 402-room hotel, developed under a franchise agreement with Korea Development Group and managed by Styleloft Global Corporation, is Wyndham Hotel Group’s 28th destination in South Korea following the openings of Howard Johnson Jeju Seogwipo Harbor, Ramada Jeju City Hall, and Howard Johnson Jeju Hotel Yeondong earlier this year. Ramada Encore hotels are part of the globally recognised midscale Ramada® brand. With locations throughout Europe, Africa, the Middle East, and Latin America, Ramada Encore hotels offer modern and ergonomically designed accommodations for both leisure and business travellers. Fast-growing Busan attracted more than 10 million domestic visitors and two million international tourists last year, achieving 4.1 trillion won (US$36 billion) in tourism revenue. This year, local tourism officials announced plans to boost international arrivals even more through a series of development initiatives aiding the growth of meetings, incentives, conferences and events (MICE) throughout the city. “Busan is an emerging destination for MICE travel and visitor numbers are growing thanks to infrastructure efforts like expanding Gimhae International Airport, upgrading retail centres, and redeveloping the Port of Busan,” said Barry Robinson, President and Managing Director, Wyndham Hotel Group South East Asia and Pacific Rim. Conveniently located in Busan’s Haeundae-gu district, Ramada Encore Haeundae is situated opposite Haeundae Station and offers close proximity to the city’s top business and leisure attractions like Haeundae Beach and Busan Exhibition and Convention Centre (BEXCO). It also serves as an ideal base for guests attending the city’s most exciting events, such as the prestigious 22nd Busan International Film Festival from October 12 to 21and the Busan Fireworks Festival on October 28. For a comfortable and productive stay in Busan, the hotel offers complimentary Wi-Fi in each of its contemporary guestrooms along with ergonomic work desks and individually controlled air conditioner and heater. The hotel also features a fitness centre, meeting and conference rooms, an onsite restaurant and a rooftop garden. For reservations, call +82-51-610-3000 or email rsvn@ramadaencorehaeundae.com. All Wyndham Hotel Group hotels in South Korea participate in Wyndham Rewards®, the simple-to-use, revolutionary hotel loyalty program that offers members a generous points earning structure and a flat, free-night redemption rate. More information is available at www.wyndhamrewards.com.